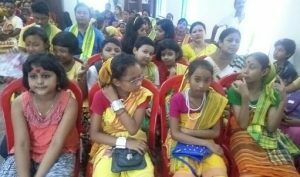 The Kokrajhar town committee of the All Koch-Rajbongshi Students’ Union (AKRSU) and the Kokrajhar-based Nabo Diganto NGO successfully conducted a seven-day summer workshop on Koch-Rajbongshi traditional cultural folk dance, songs, instrumental music of the community. 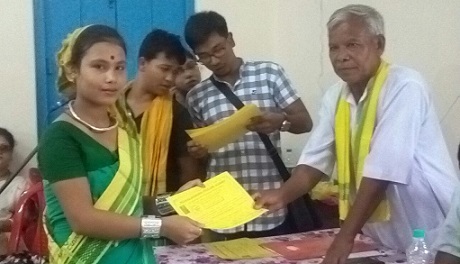 The summer workshop was held from July 1 to July 7 at the Asom Sahitya Sabha Bhavan Hall in Kokrajhar. The main objective of conducting the workshop was to promote the Koch-Rajbongsi traditional cultural folk dance and songs and create awareness among the school-going students in this regard. Over hundred school students from Chirang, Basugaon, Dhubri and Kokrajhar, Choraikola, Chandrapara, Sakti Ashram, Salakati and Photgaon participated in the summer workshop where four experts taught the participating different forms of Koch-Rajbongshi dances and songs.